Celebs have been driving hybrids for years, and now that some of the luxury brands are going electric, BMW’s chic new i8 plug-in hybrid has been given a new role: movie star. The electric hybrid will serve as Tom Cruise‘s car in the new Mission Impossible film installment, The Ghost Protocol. And if you’re agent Ethan Hunt (played by Cruise), this is a car you’d definitely want on your side. 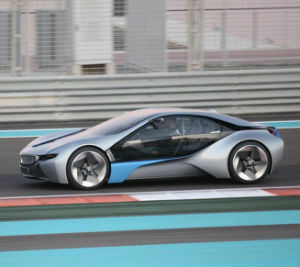 The BMW i8 promises to go from 0-60 mph in five seconds, is powered by a 328-horsepower diesel-electric drivetrain, has a top speed of 155 mph, and fuel efficiency of 62.5 miles per gallon— in other words, the perfect getaway car. Action films like the Mission Impossible franchise tend to make cars a vital part of the film, so it’s great to see that this latest movie will be promoting and showcasing an eco-friendly one. Granted, the i8 is estimated to cost you upwards of $160k, so the average movie watcher won’t be able to run out and invest in one themselves. But part of the stigma surrounding electric cars is that they simply aren’t as capable as a regular car, and hopefully a film like this can dispel that!